Which girl do you prefer? Camo or makeup? Why does this always happen when I move to another side of the campfire? These are some of the best things we've seen on pinterest. Even if you're not on it, check them out. Great infographic of the 7 types of campers. Hope you enjoyed the guide to preparing for Doomsday. Now go check out our Extremely-Sharp Survival Gear and stock up! Now that you've reviewed the top thirty five reasons to hike you need to check out the Extremely Sharp Camping section to get your gear! A wonderful infographic about 35 reasons to hike the appelation trail by the geniouses at 97thfloor. Discover why so many hikers visit the Appalacian Trail every year and secrets along the trail. It takes 5 months to complete and only 13% who attempt it finish. It spans from the state of Maine to Georgia. The trail is marked by about 160,000 white trail markers. Is that a Sign or a Trail Blaze? Have you ever been hiking and wondered, is that a Sign or a Trail Blaze? (A trial blaze is a mark the direction of the trail. In older times a tree could be blazed by hatchet chops, these days it is often paint on trees in a consistant shape and color for the particular path.) 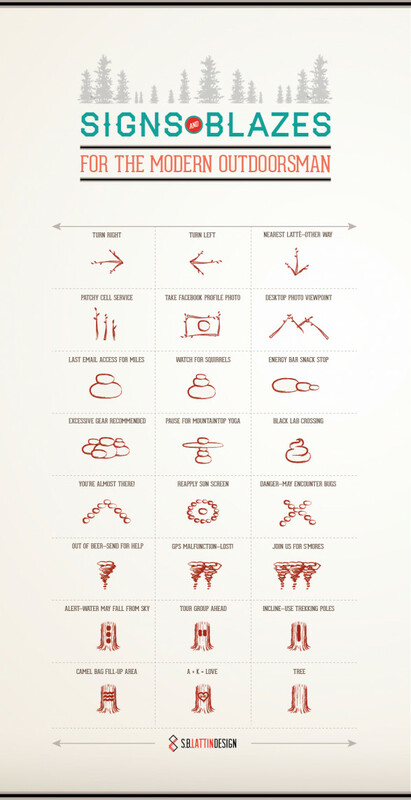 The following infographic is pretty humerous for anyone who has spent a good amount of time hiking and been confused by the "signs" left as trail markings. Enjoy! Now that you've had a good laugh, head over to the store and grab a knife for your next hike or maybe a machete to help clear your path. If you prefer to shop with family owned buisiness and support local American businesses, you'll love our site!